Best Quality Products for You. Here is the pair of gloves exclusively made to give you super protection right up to your elbows while gardening. Wear them on and prune your loved plants without getting pricked or scratched by their thorns. 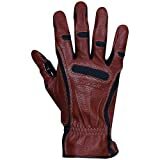 These gloves are made from genuine leather and are gauntlet length gloves. 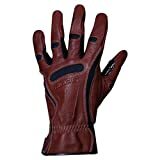 Lined up with fleece they are soft but sturdy, flexible, durable and more breathable keeping your palms sweat-free. Their excellent puncture and heat resistance make them not only perfect for rose gardening but also for blackberries, cacti, and thistles. They also offer full protection when pulling poisonous oak and ivy. You might be planning a purchase of a complete tools set including hand gloves. If so, this 8-piece garden tools kit is just meant for you. It includes pruning shears, garden trowel, transplanter, weeder, cultivator, hand rake, garden gloves, and a tote bag. All tools are Ergonomic friendly & have comfortable TPR grip handles. They are strong enough for heavy-duty performance, as they are made of high-quality polished Aluminum, which makes the items rust-resistant and long-lasting. Is one of your good friend moved to a new house with a big garden? You can express your best wishes and good will with an ideal gift along with a card. What else can it be than this Gardening Tools Set? This set offers Lasting Value. It Includes Right and Left-Hand gloves with Fingertips claws to provide protection and safety while pruning Rose or similar thorny plants. 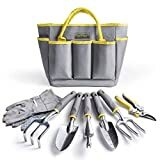 Its latest and Ergonomic based tools, a pair of durable gloves and the modern tote bag are perfect for all your garden needs, such as digging, weeding, loosening soil, aerating and transplanting. Is gardening your occupation and therefore part and parcel of your life? Your work demands heavy duty gardening gloves like these. The Tough Pro work gloves are made for a variety of applications. Wearing these gloves reduce vibration when operating power tools. So now you can dig furrows, make channels, drill deep with better protection and preciseness with these on. The gloves are made from stretchy Lycra and have the Ergonomic design. The silicone-reinforced fingertips and palm protection pad ensure safety for your hands. Made from quality and durable materials, they will prove lifelong companions, working hand-in-glove with you. Aren’t the moments spend in the garden with flora and fauna some of the best moments for you? Don’t let those prick episodes rob you of your lifted mood. Protect your hands well. You can do this by choosing the right kind of gloves that are soft on your skin. Gloves manufactured by Zeemplify are such. They are made from nature’s most durable goatskin leather, which provides the ultimate protection and flexibility without sacrificing comfort. They are ideal for planting, digging, cutting, heavy-duty pruning, raking and shoveling. With them on, you can easily do even the tasks that require a high level of sensitivity in the fingers like grasping seedlings and small objects. Your job as a gardener includes more than just pruning plants or shoveling the soil. If you don’t wear proper gloves, your hands are more vulnerable to cuts and puncture in such heavy tasks. It is sheer negligence towards your own safety. TecArmor PLUS Tactical Made with Kevlar Work Gloves have the Cut Resistance level A6 (ANSI 105), and the Puncture Resistance level A5 (ANSI 105). They are just right gloves for preventing mishaps. They provide the high level of protection along with comfortable feel. Painting or coating pots with enamel, dealing with pesticides or other chemicals harmful to the skin are some challenges you have to face often as a professional gardener. While these chemicals are irritating, more so could be the changing of gloves every now and then according to the task. How about a pair of gloves wearable for all? SHOWA Atlas 380 Patented Glove, can be a good option. It is light in weight. It has the oil-resistant coating to ensure the firm grip, whether you are digging soil or spraying chemicals. Its open-back provides breathability to skin and reduces sweat. Nitrile coating reduces the risk of allergies. It has the Elastic cuff that prevents soil from entering the glove. Do you enjoy taking care of your plants so much that you forget to care about yourself while gardening? You need to change not your habit but your gloves. 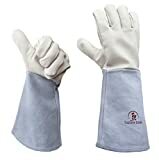 Buy a pair of Foxgloves Elle Grip Gloves and cast care of your hands, wrist, and forearm on its extended sleeves. It has extraordinary versatility! Its Supplexnylon feels cottony soft but is tough and resilient. The Lycra elastane provides four-way stretch and form fit. Above all, its breathable knit fabric keeps soil out, hands and nails clean. So no problem even if you have recently done your manicure. Are you one of the proud owners of the beautiful house with the garden full of Roses? While enhancing its beauty, you have to deal with thorns and other pines truest to its nature. You can choose to be prepared. Switch to StoneBreaker Gloves Rose Gauntlet Women’s Gardening Glove. Materials Matter you see. Its high-quality leathers and breathable synthetics deliver real protection, all-day comfort, and longer glove life. The wear and tear, as well as abrasion prone areas of the glove, are treated with leather patches and the overwrapped stitches. The “Second-Skin” fit of the gloves take the shape of your hands like they were made for you. They provide a firm grip and stay in shape year in and year out. Your man is a hard-working man who loves to spend the entire day in gardening out of fondness or duty. In both cases, the Bionic Men’s Tough Pro work gloves would prove the ideal and thoughtful gift to him. 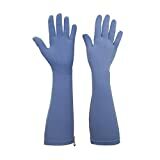 These heavy duty work gloves are designed by the orthopedic surgeon and are best for power-grip and dexterity. So, whether your beloved is landscaping or mowing the lawn, its unique vibration-absorbing padding helps prevent hand and joint pain. Thus allowing him not to compromise on his diligence- the very quality that attracted you! Material: You’ve to handle many difficult tasks when you’re doing gardening which includes handling thorns, pruning and others. This requires that you get a pair of gloves that’s made from high quality material. Gloves made from Leather tend to be of high quality and gives the best protection while working in the garden. Appropriate padding at the palm, fingertips and thumb lets you have the best protection. Design: This is an important aspect in selecting gardening gloves because it is often the design of a glove that determines your comfort and hold. There are gloves designed to be used by Men and Women. Choosing the right glove depends on the kind of work you’ll have to do. You’ll find gloves that fit snugly to your hands on the other hand there are gloves that are bit bulky and provide more comfort from the inner side. So, choosing the right glove solely depends on your purpose. Comfort: This part of your gloves is especially important when you are contemplating to wear them for a long time. Check whether the gloves are designed to give adequate breathability and inner comfort. This will help you to work for a long time without removing the gloves. Inner material and grip of the glove also plays an important role in ensuring comfort. Gardening for sure provides many benefits besides the joy of recreation. It gives the opportunity to a range of good exercises. Gardening burns enough calories, which also keeps you fit and healthy. However, we can derive the fullest benefit from it only if we are doing the task with the proper tools and gears on. So, enjoy your multi-beneficial hobby with right kind of gloves on and continue to shower your parental care on your best buddies- the flora and fauna that make you smile, even being in the lap of thorns.